On Friday, I tripped down the rabbit hole of Google + field test with many other social media early adopters and nonprofit technology (#nptech folks) who were kicking the tires. Google + is Google’s new social sharing platform. (Here’s the official announcement on the Google Blog and review in the New York Times. You won’t be able to play with until Google does the full roll out, you’ll have to click the keep me posted button: here). Google + was just one of a series of new releases and changes as part of leveraging Google’s communications products. I found it overwhelming! It is a very different experience to take a deep dive into social platform today than it was five years ago when social spaces like Twitter and Facebook were emerging. It takes time to understand a platform, effort to incorporate it into your strategy and work flow. For those who work with nonprofit technology, we have to determine what are the compelling use cases for nonprofits on new platforms. As my colleague Geoff Livingston points out, nonprofits have limited time. It is our most valuable commodity. How do we invest that time as wisely as possible to have the greatist impact? Let’s face it. Unless you are an Internet personality, an organization with a full-time community manager or a professional online content publisher, there is not enough time to succeed in the multitude of social networks AND manage your own social content. Let’s consider the list of most used forms: Facebook, YouTube, Twitter, Google+ (assuming all continues to go well), LinkedIn, FourSquare, Gowalla, StumbleUpon, Tumblr, and your own site. This means choices will be made. Some will spread the peanut butter a little thinner, trying to make it stretch further. Others will simply focus on the networks that have the most impact on their community. The early days of exploring a new platform are like wandering around in the desert trying to make sense of how it works and think through how it might hold some future value. Colleague Debra Askanase was also overwhelmed and wrote this terrific reflection on how to be a thoughtful, responsible early adopter in the nonprofit technology community. A lot of NPTECH folks raved about the beautifully simple “friend management” features that Google + offers through circles. Much easier to figure out how not to share everything with everyone or spend than Facebook as Amy Sample Ward writes about in her early thoughts on the platform. This is a big issue for teachers who don’t want to friend their students for obvious reasons. It is also important for those who work with nonprofit social service agencies – who have to keep some professional distance between themselves and clients. Features are one thing, but the big question a nonprofit has to also answer: where is their audience? 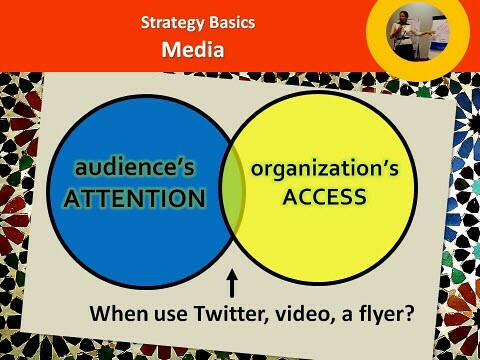 I’m reminded of this slide from Mary Joyce from the E-Mediat Training. We could simply add the word “Google +” As Jesse Stay points out, no one social platform isn’t necessarily going to kill off all others. And that’s why it is critical to be strategic. But it is also attractive to some NPTechers was the ability to have more intimate conversations. Judi Sohn compared Google + as the small group conversations we might have on the couch in the corner at the Nonprofit Technology Conference compared to Facebook which was more like the keynote with a back channel. Google+ lets you organize your contacts into circles or groupings that no one but you can see. But, given that circles are not open, you don’t necessarily know how you’ve been categorized by others and when respond to someone who has shared something with you as part of their circle – who else may be reading it. The first circle I started was “NPTECH.” It’s been the early adopter tag for nonprofit techies since 2004 when Marnie Webb started using it to experiment with delicious. The tag is still active on Twitter and other places. This crowd hangs out on different platforms — and we manage to find each other. Many of us have met face-to-face because we attend the NTC (Nonprofit Technology Conference) which has often been called a family reunion. When Google+ hit, it was like a bomb was dropped and we were all slowly coming out the bomb shelter. We started to look through each other’s “circle lists” to find other people or ask “Whose here?” I quickly found about 100 NPTECH colleagues. What’s really weird to me is having a #nptech circle without Holly Ross who I think is on vacation. It would be a more community like conversation if it was an “open circle” or functioned more like groups. They way Google + is designed to preserve privacy, can be like a community diaspora. I’ve also seen the sames questions and snippets of threads various NPTECHers profiles, would love to share across the community – but unclear if they are in each others circles! This will change as more users come to the platform and understand how to use it. One of the ways I use online social tools is for learning whether in public or online communities of practice. It is these conversations with a community that I find most compelling. This is what was missing from the experience for me and that I didn’t like about it. It wasn’t until I discovered Ross Mayfield’s visual guide to the “Asymmetric Sharing” that I better understood how Google+ sharing is different from places like Facebook and Twitter. As Mayfield points out, it get high marks on privacy, but it looses discovery, serendipity, and retaining social context. The jury is still out whether Google+ will be a transformational, disruptive technology – and whether normal people will embrace. It is only five days old – time will tell. For me, I’m exploring simple and light ways for listening on this channel and for learning more about when it might make strategic sense for a nonprofit to embrace it. Loved this post. In depth. Thoughtful. Shared on Twitter, G+, and FB. I submitted a request to Google for public circles, but after reading this post, I realize we also need shared circles. They’ve done an amazing job, but we still have a long way to go. I am still trying to get my head around the whole Google + element! I think it might take me a while yet to come round to the idea, I miss the community aspect of FB too much at the moment but I am hoping that this will eventually change and Google + progresses. Great post! It’s interesting that Google+ is designed to preserve privacy, compared to when Google Buzz was launched and everyone was opted in by default. Did Google learn something from the uproar? Anyway, so far I like Google+ as I am exploring and learning the ropes. I just want more people and friends to join! You realize that the guy who did the slideshow added our current President’s name to the f***lords circle right? Great post, Beth! Thanks for your thoughtful analysis. That slideshow was pretty epic, great info!